If you want your own full floor on Fifth Avenue for $3.3M with four bedrooms, three baths, beautiful Central Park views, great space and amazing value, come and see Apartment 4CD at 1215 Fifth Avenue. 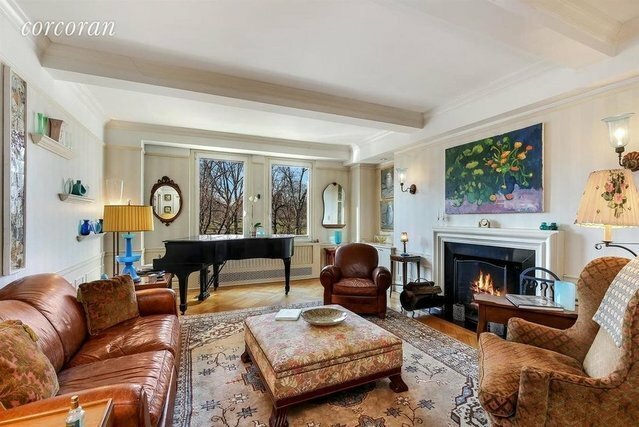 Elegant prewar details throughout, eight windows with stunning Central Park views (living room with wood burning fire place, as well as the two large front bedrooms with en-suite windowed bathrooms). The apartment has a formal dining room and large eat-in kitchen. The back part of the apartment is currently configured with two bedrooms, one bathroom, an office or media room and laundry room. 1215 Fifth Avenue (The Brisbane House) is a grand, full-service co-op built in 1926 and designed by Schultze and Weaver, architects of the Pierre, Sherry Netherland and Waldorf Astoria. The Brisbane House is named in honor of its eponymous financier, Arthur Brisbane who was one the most widely read journalists of the 1930s within William Randolph Heart's empire, and the occupant of a remarkable penthouse covering the entire top three floors of the impressive structure. With its four story limestone base, beautiful lobby, professional staff, personal and bike storage and a fitness area, 1215 Fifth Avenue is the perfect building to call home. Apartment 4CD at 1215 Fifth Avenue is a spacious, elegant apartment and great value on Fifth Avenue. Please note, flip tax is paid by the buyer.